Even before the Flame of Hope was given away to conclude the Middle East’s first Special Olympics World Games hosting this week, officials were already talking about returning the event to the UAE capital at Thursday’s closing press conference in Abu Dhabi. The conference was held after the final matches at the Games, which saw more than 7,500 athletes from 200 countries participate across 24 sports. According to Shriver, this has been the largest Games in terms of the number of athletes and countries participating. “More importantly, here in the UAE, our athletes have been treated as though they are the best, and though they do not get to hear this enough outside the Games, the truth is that they are,” said Shriver. The UAE contingent has also performed exceedingly well in the World Games this year, participating in all categories. 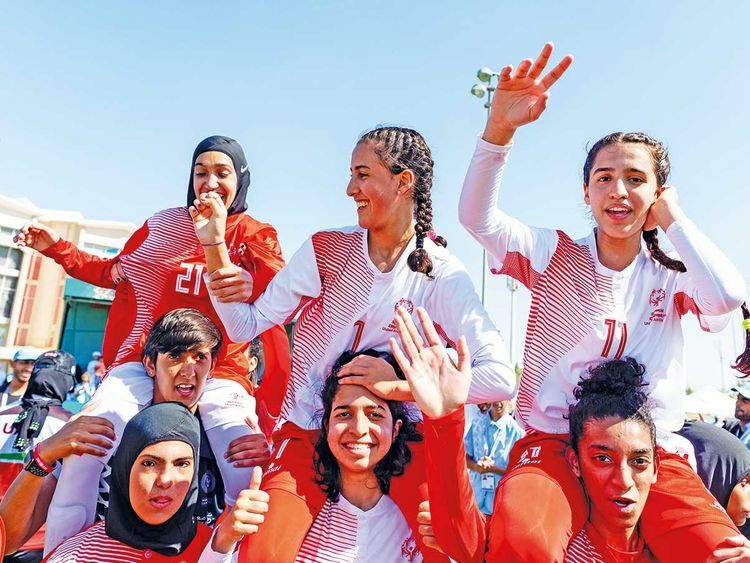 Between them, the 297 athletes and their unified partners earned a total of 182 medals, according to Tala Al Ramahi, chief strategy officer for the Special Olympics. In addition, nearly 30 per cent of the UAE’s athletes were women. “The Games are concluding, but our work will go on,” said Al Ramahi. “We will focus on training athletes in all these sport categories, and also work to build a robust family programme to support this training. In addition, we hope to extend the Healthy Athletes programme, which offers free annual health screenings for people with determination. “Another of our key missions is to promote inclusivity, and we will do this by spearheading unified sports activities,” she added, referring to the Unified Champion School programme. As reported by Gulf News on Sunday, the programme aims to regularly set up unified sport competitions across all public schools in the UAE. The conference was also attended by Hessa Bint Eisa Bu Humaid, Minister of Community Development, and Dr Sultan Al Jaber, UAE Minister of State and chief executive officer of the Abu Dhabi National Oil Company (Adnoc), who assured that the legacy of the Games will live on through a number of government and private sector initiatives. “As the largest employer in the UAE, we will promote more inclusivity by providing enhanced support to employees with determination, including educational assistance and flexible working hours,” said Dr Al Jaber. A country-by-country breakdown of medals was not announced at the conference however, with Shriver saying that “medal tallies promote the wrong message [and negative competition] in sports. “Our athletes came, played and had a good time. That’s what’s important,” said Shriver.